Hunting is a popular sport in Austria. This is probably the reason why most of the dogs that originate from Austria are hunting hounds. The Alpine Dachbracke, the Styrian coarse-haired Hound, the Tyrolean Hound as well as the Austrian Black and Tan Hound are most valued by German royalty and Austrian hunters. 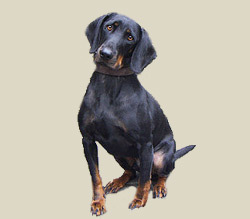 The Austrian Black and Tan Hound together with the Tyrolean Hound and the Styrian coarse-haired Hound are known as the Grand Brackes. Grand Brackes are dogs that were primarily developed to be able to hunt in Austria"s mountainous areas. Many dogs can be trained to skillfully perform tasks not natural to canines, such as in this dog agility competition.Dogs are valued for their intelligence. This intelligence is expressed differently with different breeds and individuals, however. For example, Border Collies are noted for their ability to learn commands, while other breeds may not be so motivated towards obedience, but instead show their cleverness in devising ways to steal food or escape from a yard. Being highly adaptable animals themselves, dogs have learned to do many jobs as required by humans over the generations. Having been bred for hunting, these dogs require regular exercise. Owners should take their Austrian Black and Tan Hounds out for long walks daily. It would also be good for these dogs to run around and play in a large, secure area.